Verso is Latin for reverse and the aim of Verso skincare is to reverse the signs of ageing or at least delay them! 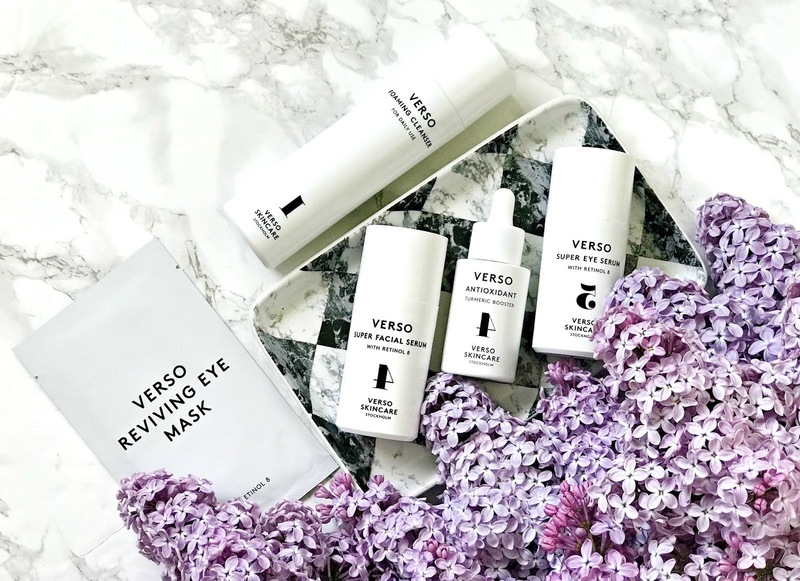 We all know that retinol is the only proven anti ageing ingredient but Verso have patented their Retinol 8 Complex, which means that their products containing this complex are eight times more effective than regular retinol products - grabbed your attention? I thought so! Their monochrome packaging and 1,2,3,4,5 steps have made it simple for everyone to understand what order to use products in. Each product has a number on the front so you just can't go wrong! I want to share my thoughts on some of the products in the range with you today! I first tried some Verso products in March as I had received a Travel Series and my trip to New York was the perfect time to test the products as the minis took up very little space in my bag. This little set contains a Foaming Cleanser and a Day and Night Cream. Now as regular readers know, I have dry skin so I usually avoid foaming cleansers as they dry my skin further but this one doesn't. It has a mousse-like texture and whilst it foams when added to water, it doesn't leave the skin feeling squeaky clean, which is akin to feeling stripped. Instead, my skin feels clean and comfortable, soft to touch and looks very clear. My only problem is that my husband loves it too but luckily, a little goes a long way! Both the day and night cream were nourishing enough for my dry skin, yet somehow not greasy at all. They absorb quickly to leave my skin feeling comfortable, smooth, soft and radiant. I need to buy the full sizes of both! I have previously raved on the blog about the Antioxidant Turmeric Booster, which is ideal for reactive or sensitive skin and is therefore, ideal to use with retinol products. This serum has a silky gel-like texture and as soon as I apply it, my skin is instantly soothed and any areas of redness or inflammation are calmed. Its antioxidant formula also protects against UV damage and free radicals so it has both instant and long-term benefits and with continued use, my skin is plump, nourished and calm. Pricey but definitely worth it in my opinion. Another serum is their Super Facial Serum, which has quite a rich, creamy texture but it absorbs immediately. This product has many benefits but the main one, which has stood out for me (well actually there are two!) is that it has faded an area of hyperpigmentation that I have had for a few years due to my skin reacting to the sun because of medication that I was taking. I actually cannot see this pigmentation at all now whereas previously even my little niece asked me what it was! The second major benefit that I have noticed is that the lines in my forehead have diminished hugely - those two results alone justify the price tag for me! Similarly, the Super Eye Serum has helped to plump the whole under eye area so my fine lines are, again, diminished and as a result, any concealer or foundation applies evenly and beautifully over it and I actually need less product there too. The combination of Vitamin A and Hyaluronic Acid delivers a powerful does of hydration but it isn't so rich that it will give me milia, which some other plumping eye products do. Again, only a tiny amount is needed per use so the price tag is justified. Finally, I have used my last Reviving Eye Mask! These are ideal for on flights, before a special occasion or when you have had a few sleepless nights as they take 5 years off the eye area! Seriously - they make you look like you've slept like a baby for 10 hours because they plump the under eyes and banish all signs of fatigue! They are saturated in a complex of Vitamin A, hyaluronic acid, grapefruit acid and ceramides and you cannot help but be wowed when you use them! You can shop Verso from MMCL Pro and save 25% by using the code BBUKPRO25. Verso is also available from Cult Beauty and Space NK. If you want to keep signs of ageing at bay then you could do no wrong by checking these products out! I feel like I won't settle until I've tried every product in the range!